A large map of Scotland, a copy of Visscher's map, with two fine cartouches. 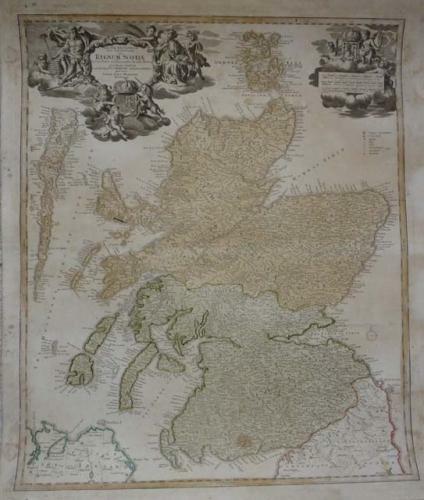 This was the only map of Scotland produced by Homann: it was used by him and his heirs until 1790. In very good condition with original body colour; with some recent embellishments to the title cartouche and mile scale. The Homann family was the most important map publisher in Germany in the eighteenth century. The business was established by Johann Babtist Homann (1663-1724) in 1702 and bequeathed to his heirs on the condition that it continued to trade under the name Homann Heirs. In good condition but with mild overall toning and a few water stains in the margins. Would frame well.